It's almost as though the many brilliant actors, writers, and directors of colour aren't even considered for the vote. It's like they don't even factor into the equation. I can tolerate a lack of imagination in the vote, where people are often rewarded more for their years of service than for the quality of their current work, but I can't sit by saying nothing about the shocking lack of diversity in the pool of nominees, two years in a row. I'm really annoyed at the Oscars this year. It's bad enough that there were no people of colour nominated in the acting or directing categories last year, but two years in a row? That can't just be an unfortunate coincidence. It's almost as though the many brilliant actors, writers, and directors of colour aren't even considered for the vote. It's like they don't even factor into the equation. 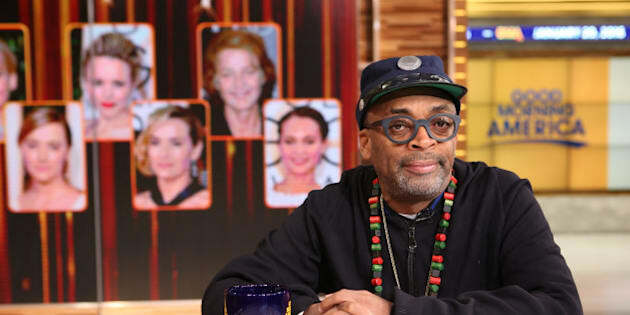 I've been reading about how various people are saying that they'll stay home for this year's Oscars, including Spike Lee, but if it were up to me, I'd go a few steps further. I'd invite everyone involved in the Oscars show to call in and say they aren't coming this year, and to explain why not. This would include the presenters, the nominees, and the host. It's hard to create change, so something drastic needs to happen to show the powers that be that this is a completely unacceptable state of affairs. I've always been ambivalent about the Oscars. The vote tends to be skewed toward the most conservative choices. When I'm rooting for the edgy performance or the "out there" film, the safe bet is often the one that takes home the prize. I can tolerate a lack of imagination in the vote, where people are often rewarded more for their years of service than for the quality of their current work, but I can't sit by saying nothing about the shocking lack of diversity in the pool of nominees, two years in a row. It's time to explode the myth of a post-racial society. People of colour are being gunned down with alarming regularity by usually white law enforcement personnel, and riots in places like Ferguson, Missouri are becoming more and more common. It's clear that the tinder box is about to blow. The rise of the Black Lives Matter movement, promoting awareness about extrajudicial killings of people of colour, is yet another indicator that we need to face the facts. In 2016, racism is alive and thriving in Canada and the United States. The Oscars of the past two years seem to mirror the polarization that we're seeing out in the streets. While there are amazing performances by actors of colour, as well as terrific examples writing and directing, none of these are being recognized by the Academy of Motion Picture Arts and Sciences. The Academy is a corporate entity, and as such, has a major focus on the bottom line. If change is difficult to enact, we may need to hit the Academy where it hurts most, that is, in the wallet. A full boycott of the Oscars by all the participants might be the only way to make the Academy sit up and pay attention. It might be a great way for those involved to say, "Wake up already!" to the Academy, so that we can finally start seeing some more equitable representation in the nominees for the various Oscar categories. Even the Academy president, Cheryl Boone Isaacs stated that things need to change, and quickly, and while she's not in a position to call for a boycott, others are. And to that point, I urge the people involved to stand up and say "Hell no!" to the Oscars this year. If the ceremony is cancelled, and the Academy is both embarrassed and takes a hit, financially, perhaps, just perhaps, a much-needed change can finally come, at least in this bastion of Hollywood conservatism. Sign up here for my free monthly wellness newsletter. February is all about love! Take our quiz and find out if your relationship is the real thing.